Emergency Repair Services -When Is An Emergency Roof Repair Needed? Your roof is your first and last line of defense when it comes to protecting your home from storms, rains, and falling debris. Not only does it protect the structure of the home itself, but it protects you and everything else inside your home. It should go without saying that you need to do as much as possible to keep your roof in optimal condition. Sometimes, the condition of your roof after a storm may call for an emergency roof repair in Atlanta. In general, regular roof repairs are always a good idea. If you’re lucky enough to live in Atlanta or the surrounding area, then you have one of the best roofing companies at your disposal. With regular roof repairs, you have the benefit of planning ahead to some degree. However, when it comes to an emergency roof repair, you won’t have such a luxury. In those cases, you have to act quickly and with confidence. Acting quickly means you should already have a particular roofing company in mind. You should do the difficult work of finding a quality roofing company or contractor long before an emergency occurs. This way you can act promptly and won’t be rushed to choose a particular company that you may later regret. What Qualifies For Emergency Roof Repair? What actually qualifies as an emergency repair? When your roof is damaged it may seem like an emergency no matter the circumstances. It is true that any damage to the roof should be repaired as quickly as possible, but there is some distinction between the normal repairs required by a roof and an emergency repair situation. 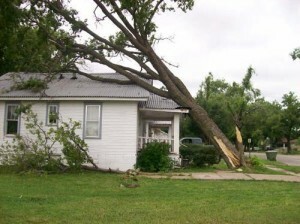 In most cases, emergency repairs are required after storms or storm-like conditions. This includes heavy rain, strong winds, snow, or hail. The weather itself may damage the roof or it could blow heavy debris into the roof that causes serious damage. If there is noticeable water leaking into the home from the roof, then it is definitely an emergency repair situation. A serious leak is the last thing you want in your home. Ignoring a leak for even a day could wind up costing you thousands of dollars on top of the cost of repairing the flat roof. Water presents multiple threats to the integrity of your home. First, it will damage the actual structure of the roof beneath the shingles. It will then enter the house and damage the ceiling or anything in the attic if you have one. Afterward, it will continue downwards, potentially damaging the walls, floors, and items inside the home itself. Water also encourages the growth of mold, which can begin forming within 48 hours of the leak occurring. Mold can damage the materials in the home, poses a health risk for humans and animals, and is generally very costly to remove entirely. Even if you were to notice the leak the moment it occurred, which isn’t likely, every moment wasted is dangerous. That’s why it’s important you act immediately and contact a roofing company that provides emergency roof repair services. Of course, if the storm is still raging on you won’t be able to get a contractor on the roof to fix the damage. You’ll have to do your best to control the spread of water from the inside until the winds and rain have died away. Try to prevent any puddles of water from forming on the floor. Definitely do not attempt to get on the roof and patch the hole yourself during dangerous weather. As soon as the storm has passed you should immediately contact a roofing company and start discussing an emergency repair. You’ll provide them with information about the problem and they will give you a general estimate of the costs for the project. The final costs may be different from the estimate because they aren’t able to see the problem over the phone. Remember, every moment you waste after the storm has passed could wind up costing you more money. Major repairs on the roof may seem expensive, but compared to costs of the roof and home repairs, you’ll be saving money. Ignoring a serious leak after a storm not only puts your home in danger, but it puts you in danger as well.